Despite the success of the classic, “Metropolis”, the science-fiction film has never really been able to make it in Germany. Nevertheless, there have been interesting attempts to keep up with international developments – both in East and West Germany. Fritz Lang's Metropolis (1927) has long been considered a milestone of the genre - quoted in later classics such as Star Wars (George Lucas, USA 1977) and Blade Runner (Ridley Scott, USA, GB, HK 1982). Its intimidating skyscraper world of a rigorous two-tier society has not lost any of its iconographic clout to this very day. Beyond the film’s depiction of a social dystopia, however, we often forget just how many other elements of today's science fiction it anticipated: prehistoric videophones that ensure total surveillance; the creation of an “artificial man” in the midst of the class struggle – the forerunner of what we now see as robots and cyborgs. Often regarded as a true one-off, Metropolis was actually not entirely alone when it came to presenting utopias. Other films of the Weimar Republic (1918 to 1933), such as Paul Wegener's Golem films or Otto Rippert's earlier Homunculus series also experimented with the idea of artificial life. The ragged image of humans in the industrial age was depicted in them - coupled with “Angstlust” (the tingle of fear), the feeling of being frightened mixed with being entertained at the same time, that was so typical of expressionist films. However, Lang's Frau im Mond (Woman in the Moon/1929), one of several space-age utopian adventures, heralded in the end of the pioneering role of the German science fiction film. National socialism and the war also drove many film-makers into exile. After the Second World War and the collective experience of totalitarianism and the nights of bombing in German cities, people’s interest in technological visions of the future was not particularly great, not to mention in experiments to create a “new man”. Photo (detail): © DEFA-Stiftung/Waltraut Pathenheimer In divided Germany, space was the only place that offered the opportunity to be optimistic about the future, even if it was somewhat cautious. 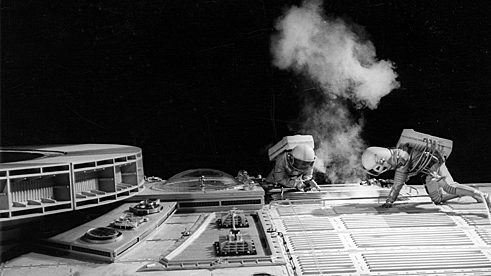 In the late 1950s, the East German film studios, Defa, produced a handful of government-commissioned space adventures. In films such as Der schweigende Stern (Planet of Death, Kurt Maetzig, 1960), coproduced with Poland, the Sputnik enthusiasm of the East Bloc was reflected, as well as the new German fear of the abuse of technology. On Venus, an international cosmonaut crew encounters the aftermath of a nuclear catastrophe that was originally intended to befall the Earth: “The aggressors have destroyed themselves!” The story and set design reveal amusing parallels to the Hollywood classic Forbidden Planet, (Fred M. Wilcox, 1956), though the political portents were different – internationalism and pacifism as the undisputed ideals of a socialist world community, even an American was part of the expedition. Eolomea (1972) by Herrmann Zschoche was much more sceptical. A disillusioned space captain doubts the sense of the cosmic mission he is on. The criticism of unproductive discussions and opaque decision-making processes can also be read as criticism of the system. The star Eolomea, visualized in psychedelic dream sequences, thus becomes a remote utopia. Despite the overly esoteric plot, the film has now become a nostalgic gem. In addition to its exotic scenes, it also has a surprisingly lively soundtrack. There was a similar development in the few science fiction films produced by the Federal Republic - mostly television productions. 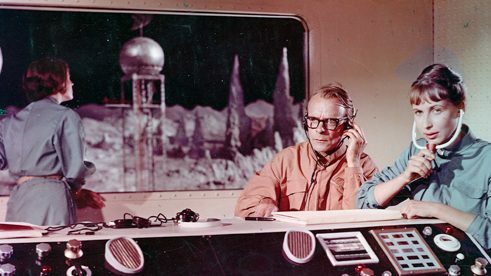 The legendary seven-part “space opus”, Raumpatrouille Orion (Space Patrol Orion, Theo Mezger, Michael Braun, 1965), was in fact the most expensive German TV series. The adventures of its smart Commander, McLane, became a cult, not least thanks to its mixture of avant-garde Sixties design and often cheap props; for example, the buttons and switches on the control panel were actually an upturned iron and a pencil sharpener. At the time, the critics spoke of “pseudoscientific nonsense”, but the series became a real hit with TV audiences. Today, it is a magnificent example of the phenomenon of retro-futurism, and it was launched almost simultaneously with its US counterpart, Star Trek (1966-69). A few years later this short-term sci-fi euphoria had also faded away. Operation Ganymed (1977) is one of the many science fiction films made by Rainer Erler, which are extremely critical of an unquestioning belief in progress. It is an existential drama about a failed space expedition that is more reminiscent of Eastern European films, like Andrei Tarkowski's Solaris (1972), than the high-gloss products of Hollywood. In hallucinatory images this “day after” scenario of a nuclear conflict reflects the fears of the budding ecological and peace movements as an almost mirror-like counterpart to Eolomea. Rainer Werner Fassbinder went one step further. In his two-part mini series, Welt am Draht (World on a Wire, 1973), based on the novel Simulacron-3 by Daniel F. Galouye, he asks the question about how future technologies affect changes in our awareness. In the extravagant interiors of the seventies, this genius of direction shows a starkly sterile world, which the scientist, Fred Stiller, realises is a simulation. Welt am Draht pre-empted the idea of virtual reality and cyberspace, which was taken up in later films like The Matrix (Larry and Andy Wachowski, USA 1999). It was the last time, for quite a while, that German science fiction proved to be a pioneer. Soon after his German beginnings with Das Arche Noah Prinzip (The Noah’s Ark Principle, 1984), the Swabian “Master of Disaster”, Roland Emmerich, started producing in Hollywood. There were also some recent, quite innovative productions such as Tim Fehlbaum's apocalyptic thriller Hell (2011) or Sebastian Hilger’s mystery drama Wir sind die Flut (We are the Flood, 2016), but unfortunately they did not gain so much attention due to their lack of adequate funding. The endless possibilities of the genre, the economic possibilities of German film funding and the constantly growing expectations of film audiences are too far removed from each other. Lars Kraume's political dystopia, Die kommenden Tage (The Coming Days, 2010), still has a fairly up-to-date impact, even today. His vision of the year 2020 shows a Europe plagued by a scarcity of raw materials, terrorism and flows of refugees; a Europe that erects a wall across the Alps to keep the onslaught from the south at bay. Sometimes the visions of science fiction are closer to reality than we thought.